As the only authorized agency in the port we can act as owner´s agent. Co-ordinate all activities for the vessel´s call, make all arrangements for the cargo and take care of all documentation. Through our worldwide, well established contacts we can assist our clients to find good soloutions for all their transports needs. We have expertise not only in shipments of sawn timber, but vast experience handling woodpulp, saw logs, generals, project cargoes and any other cargo requested. Customs clearance of import- / exportcargoes. Pre-/oncarriage. Warehousing in the port can be arranged for most kinds of cargo. We can offer 1300 metres quays and a max draft allowed of 10 metres. 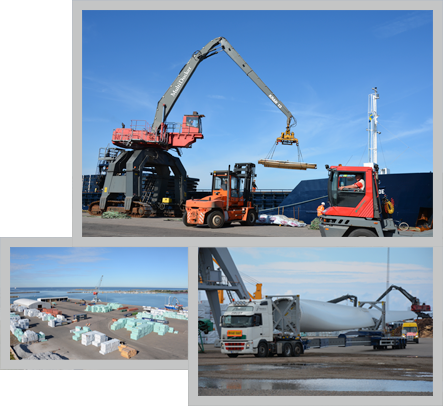 Cranes with capacity up to 45 tons together with modern equipment guarantees safe, fast and efficient cargohandling. In a rapidly changing environment, it is our aim to develop, improve and rise to meet the demands of tomorrow. Our clients and their satisfaction shall in all business undertaken, be our point of aim for competence and quality in all jobs undertaken. All and any business undertaken by us are subject to The General Conditions of the Nordic Association of Freght Forwarders, NSAB 2000, which i.a. limit our liability and entitle us to cover all our claims due for payment through sale of the customer´s property under our control. This policy will be updated regularly and latest version will be available on this webpage at all time.